Big data, machine learning and artificial intelligence (AI) are no longer a vision of the future. In fact, they are already changing the way we go about our daily lives and work: from making processes more accurate and efficient, and deriving once-unthought-of insights, to developing life-changing applications. Their potential is undeniable and it is only bound to grow. Tech startups, in particular, have identified and embraced this trend. Whether targeting business clients or end consumers, many of them have discovered the potential of machine learning and AI to bring unique value to the market. One of those startups is Dutch Analytics, a young company – co-founded by entrepreneurs Yannick Maltha, Jorick Naber and Victor Pereboom – that leverages machine learning and AI to help businesses improve their predictive maintenance capabilities. Its innovative AI driven Predictive Maintenance platform collects and analyzes all types of data, providing users with quick and actionable insights about the state of their assets. 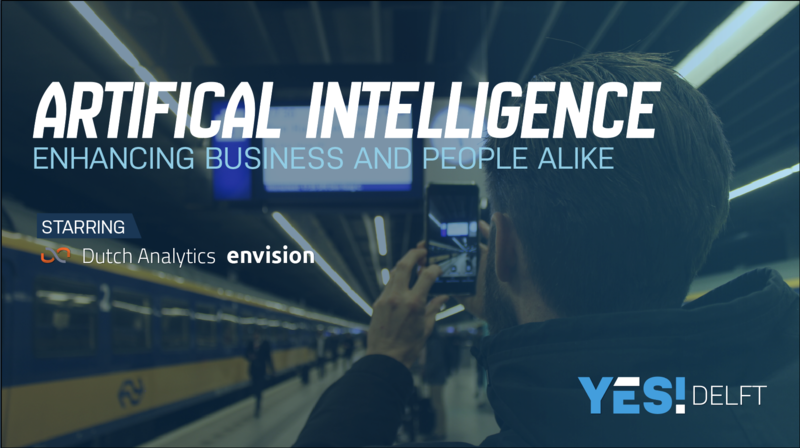 Dutch Analytics started in 2016 and grew out of a corporate-startup collaboration with BAM Infra Rail, a Dutch construction company, and with the support of the Venture Generator, a business bringing corporates and startups closer together. It is also a part of YES!Delft’s portfolio. The team’s decision to focus on machine learning and AI technology was largely based on the need of BAM Infra Rail to become more data-driven and efficient in optimizing their maintenance process. “We live in an information-driven society,” Victor says. “There are large amounts of data that we need to measure, and AI enables us to squeeze more insights out of it.” That is especially true for businesses that deal with ever-growing amounts of data on a daily basis. Basing results on incomplete or not fully relevant data is as good as basing them on no data at all. Thus, Dutch Analytics – now a team of 13 – make sure that they are transparent with their clients and work hand-in-hand with them to collect, process and analyze their data. After all, the beauty of an AI platform is its ability to learn as more data comes in, so it’s crucial for it to be learning the right lessons. Working closely with their customers is also AI startup Envision, part of YES!Delft’s community as well. Founded by entrepreneurial duo Karthik Mahadevan and Karthik Kannan, the company has developed an AI-powered tool that helps visually impaired people become more independent in their everyday lives. He teamed up with Karthik K. and in early 2017, they laid the foundation of Envision. In only a year, they have developed software that can be applied to a number of different platforms and is currently available as a smartphone app. With it, visually impaired people can use their phone to take pictures of objects, people or scenes, and immediately understand what is in front of or around them. In their own language, too. As the technology is based on AI, users can tag objects and faces, thus teaching the app to automatically recognize their personal belongings, as well as family, friends, and more. “The market has shown that they need an intuitive design,” Karthik M. says. In making that possible, the two founders spent a lot of time observing how visually impaired people use the app. “A lot of them operate it with voice, so audio output turned out to be very important,” Kathik K. adds. “That was something we learned along the way and made sure to adapt to.” As a result of catering to the specific needs of their customers, Envision has been enjoying an increasing number of users every month. While AI has great potential in improving people’s lives and enhancing business processes alike, it is still largely dependent on human knowledge and interaction. Startups understand that and are ready to build a future where people and technology work hand-in-hand to make each other better.